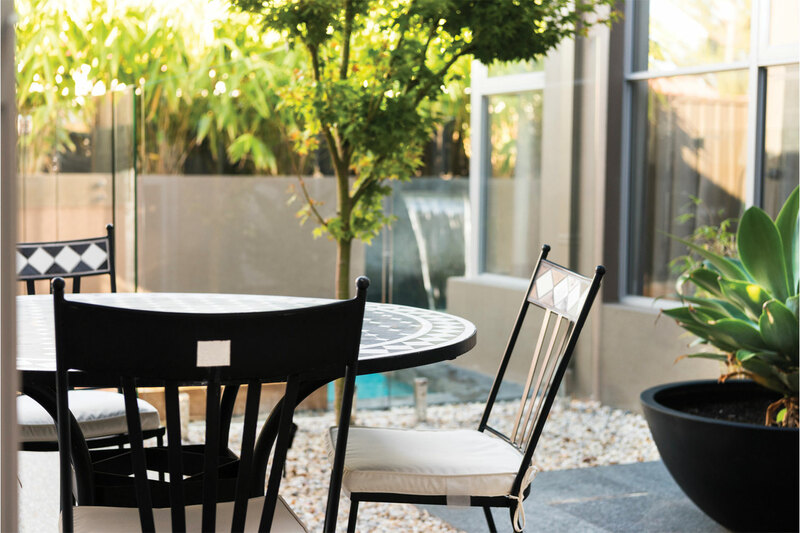 Originally offering challenging levels, this outdoor living area in northern Perth now encompasses both family-friendly areas and spaces in which adults can relax. 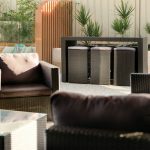 Unique features such as a beautifully designed koi pond, laser-cut screens and a honed concrete poolside bench seat set the scene for an outdoor space designed for entertaining and tranquil relaxation. 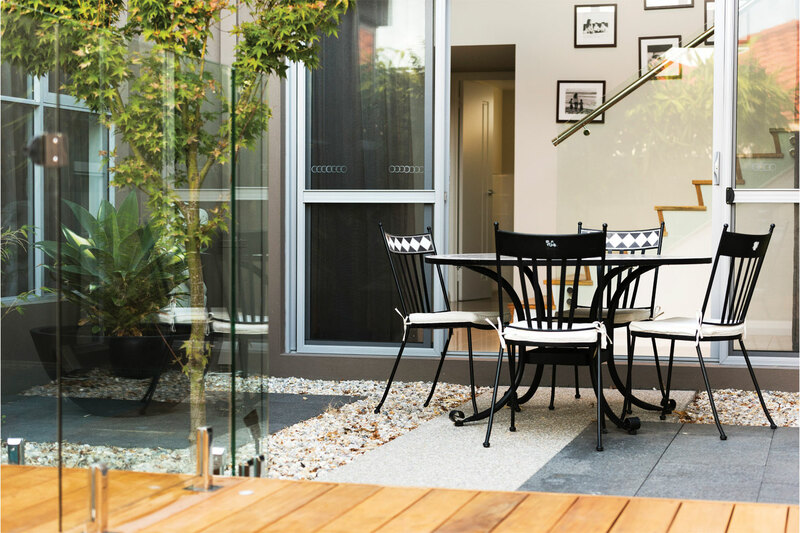 Rich colour schemes and strong lighting design complete this moody outdoor environment, designed and project managed by Denise Staffa, principal landscape designer and project manager of Outside In. The client brief to Denise included the need for a koi pond with a touch of modern Bali; poolside entertaining; alfresco lounging; a retreat with outdoor shower; a low-maintenance front verge and visitor parking with additional parking for when teenage sons can drive; a secure front yard with soccer pitch; a pool equipment area and a spot for the dogs. 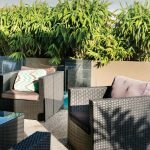 The vision was for a contemporary and relaxing style of garden, with soft and moody colour schemes, material choices and lighting. 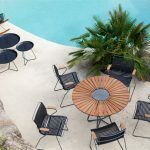 The project’s key features were to be the pond with a walkway leading over it, the swimming pool, the built-in honed concrete seat with timber inlays, feature laser-cut screens, and subtle use of two different colours of exposed aggregate concrete. 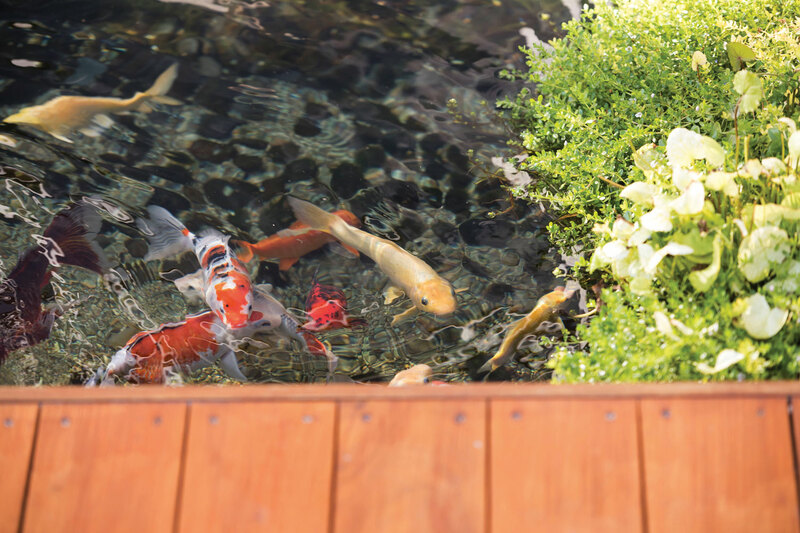 Jeremy owns a busy veterinary clinic and requested a retreat where he could clear his mind. 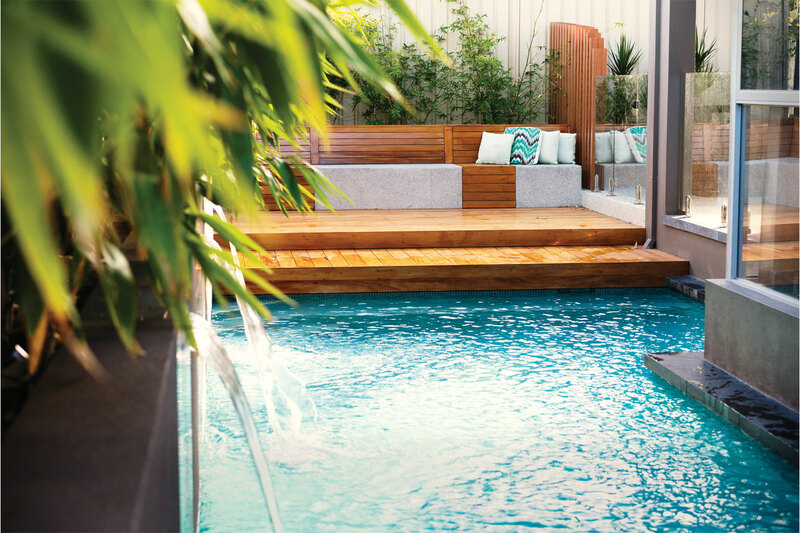 For this retreat, batu timber decking creates warmth to the pool area and at the opposite end of the pool. Denise wanted an absolute minimalist theme for the retreat, so chose the beautiful Ginkgo biloba tree surrounded by loose stones and a large feature bowl with agave for ornamentation. The remaining area was designed for simplicity and an uncluttered feel. 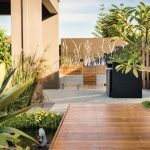 To add interest and play with texture, charcoal granite for the step pads was married with diamond-cut black-flamed granite tiles for the outdoor shower wall and poolside water walls to connect the spaces. 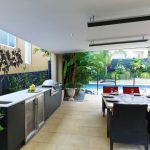 The existing pool edge on the left side was in desperate need of design ideas, not only for visual appeal both indoor and out, but to screen and hide ugly fences and neighbouring properties. A planter box design ticked all the boxes, along with the added effect of three water walls with built-in LED strip lighting. 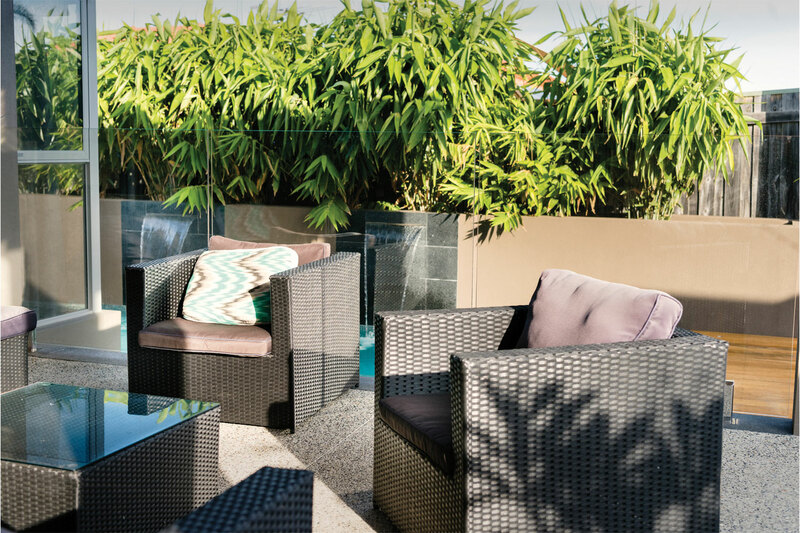 Tiger grass creates a lush backdrop and privacy. The existing limestone planter box installed by the builder was planted with a combination of bamboo and Dracaena for drama. This was originally going to be underplanted with Juniperus conferta (shore juniper). However during construction Denise changed this to Casuarina glauca ‘Cousin It’. This provides a subtle difference in height at the lower level yet still maintains the weeping effect over the limestone wall at the rear of the property to soften and give subtle coverage. The builder’s plans originally had the opposite end of the swimming pool at the same level as the alfresco, with a set of sharp steps leading into the pool. 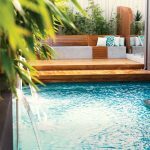 “I redesigned this area to create a soft transition from alfresco to pool, adding a larger platform-style deck step at the pool edge for sunbaking,” says Denise. 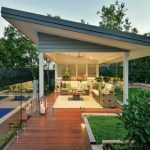 The remaining area was designed for poolside entertaining. Footing levels of the existing limestone retaining walls initially posed an issue as they were too high. 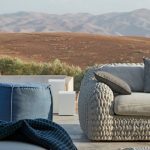 The design solution was to have honed concrete bench seating flanking the limestone walls to cover anomalies, with timber backrests that cover the remaining limestone walls here. 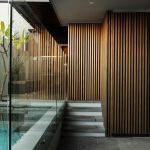 Timber slat inserts soften the concrete, add dimension and connect the use of timber. 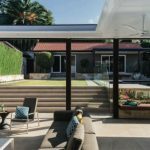 “I didn’t want to have raked panels of frameless glass pool fencing jumping to new heights over the existing limestone walls, so staggered Knotwood aluminium boxes were designed, spaced 100mm apart for pool fence compliance, which nestle into the garden space,” says Denise. Laser-cut feature screens completely screen off rear fencing. 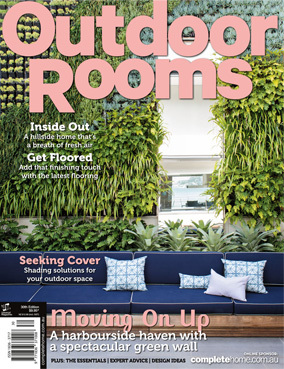 Opaque acrylic backing also allows for a cost-effective “light box” effect by using uplighting from garden spike lights below, which bring the screens to life at night. 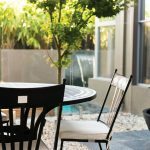 “I used our Rush design cut into a series of panels as a focal point, to add interest and screen existing fences,” says Denise. She also selected Ice Mint mosaics for the waterline tiles and Rainbow Quartz Tropicana pool plaster to reflect jade tones. 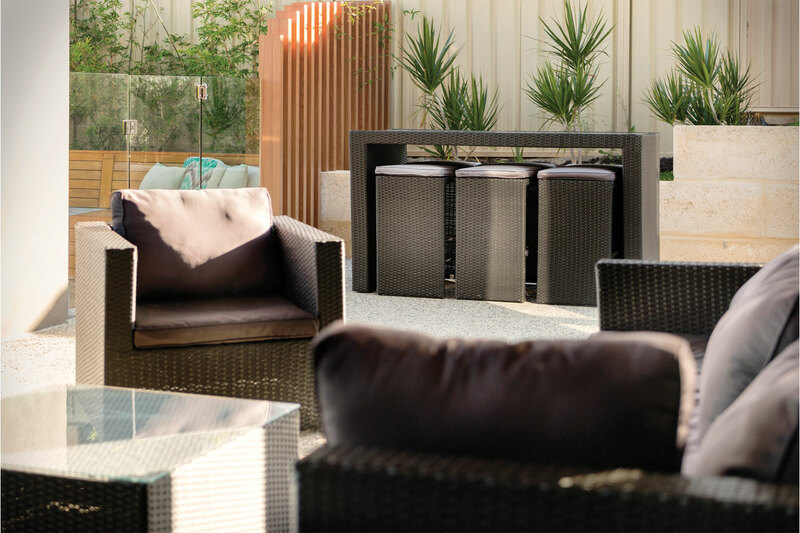 These work beautifully with the granite and Solver Crag Grey texture coat on the planter box to match the residence. 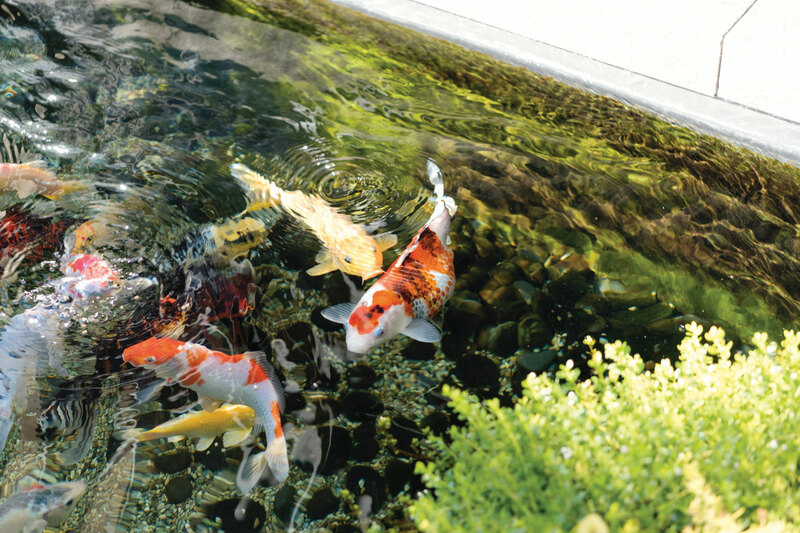 Feature frangipani with loose stones provide an entrance to the koi pond that leads to Desiree’s retreat in the corner. 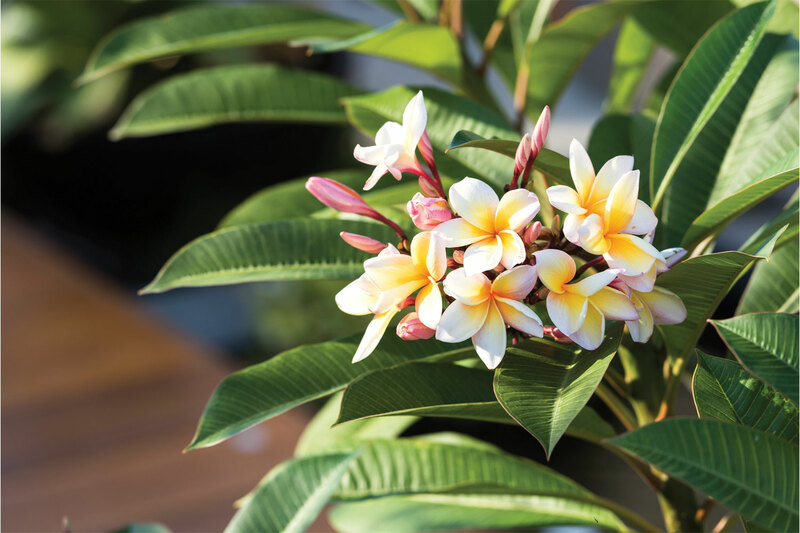 Another frangipani was added through the deck platform for balance, height and shade. 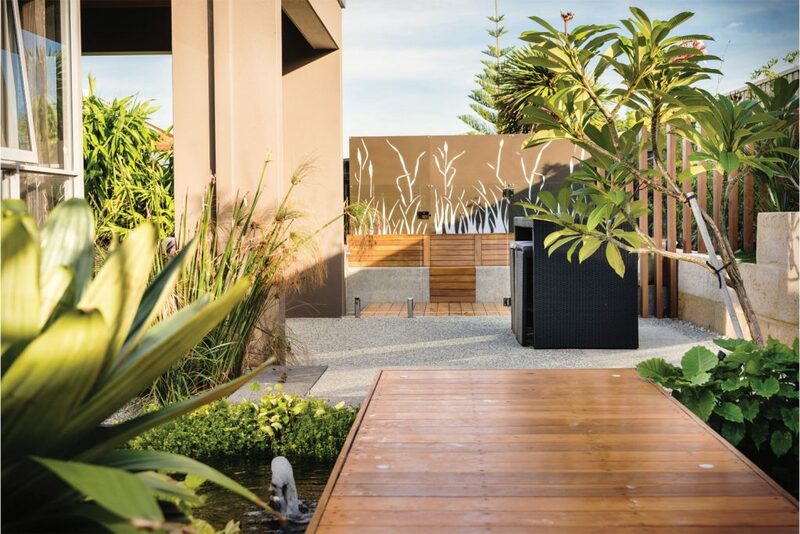 Lush, low-foliage planting throughout the pond area with colour contrast surrounds the deck to create a sense of space, while two large feature bowls planted with giant bromeliads for ornamentation introduce a touch of Bali. 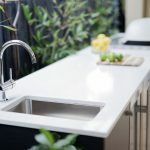 Again, the prominent existing limestone walls needed to be broken up and softened, so Denise chose a tall water feature that also creates movement at higher eye level. 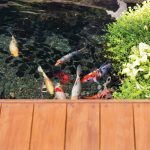 The pond was capped to match the pool and the fascia tiled in the same material. 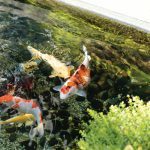 Pond plants were selected and caged in corners to ensure the koi wouldn’t eat them. To continue subtle variations within the main exposed aggregate, Holcim Boab inlays were used at both the entrance to the pond area and on the other side. 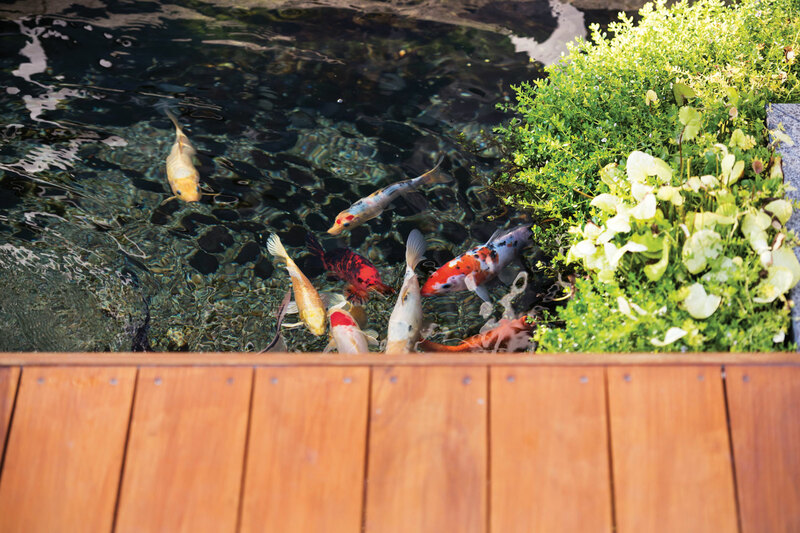 The timber bridge over the pond gives the koi a place to hide and congregate, and it also leads to Desiree’s retreat. 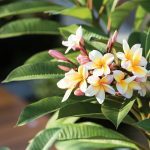 Desiree felt she was far enough away from the hub of the home to be able to relax and calm her mind by looking over the pond. At the front of the property, extensive retaining was required to obtain ample room for the soccer pitch, along with clear access in front of the residence. 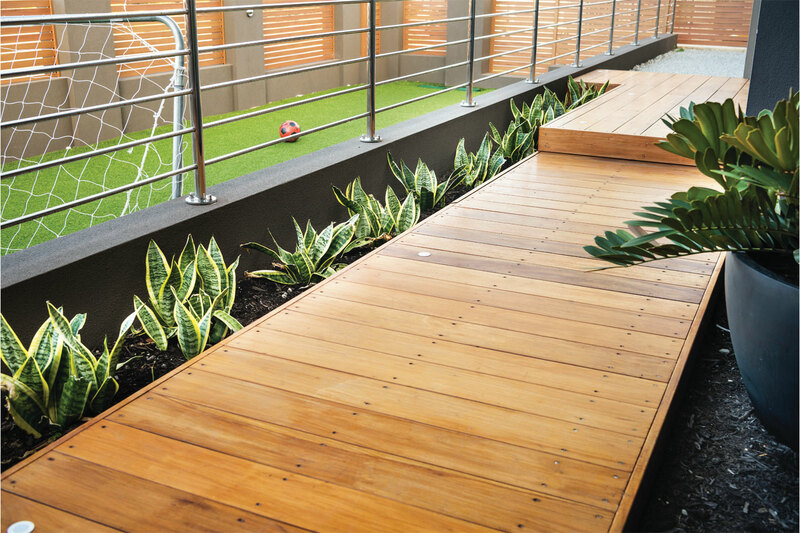 Steps to the soccer pitch and letterbox were designed to the side for maximum use of space. “As an AFL fan, I had to brush up on my soccer knowledge and spent time Googling the right soccer net to fit into this space,” laughs Denise. 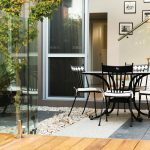 “As the residence stands very proud, nearly 2m from the roadside, and the brief was for additional parking, no real lawn on the verge and an internal functional soccer pitch, my challenges started from the roadside for the front landscaping. Knotwood aluminium slats for both the boundary wall and left-side boundary marry in nicely with the timber deck. A stainless-steel balustrade on the front retaining wall forms a connection with the balcony overhead. Denise also wanted a punch of colour through the front entrance gate, so she decided to change Sansevieria ‘Black Sword’ to Sansevieria trifasciata ‘Laurentii Compacta’. 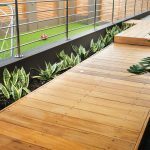 The striking variegated Sansevieria out the front along the decked areas adds colour to the home’s overall appearance. Artificial grass gives the remaining front yard much-needed green, even though it’s a soccer pitch. Screened off using aluminium Knotwood slats, the utilities and dog area is perfect for pool equipment, pond pump and clothes line, while the right side is for the dogs. 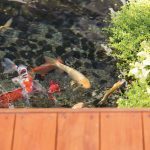 So whether it’s a space for the koi, the dogs, the soccer-mad sons or the parents, everyone here has their own piece of paradise to enjoy.